So why have I made a vow to never pay for parking again as I stated in my last post? Having lived in a few major cities with parking challenges such as Philadelphia, Washington DC, and Boston, I have had my share of opportunities to pay for parking and have done so in a few cases in the past. But no more! How did I get this way? Read on. In the City of Philadelphia, I often had to park around the corner from the house I grew up in. When I used to return home to visit, sometimes I parked so far away that I would get up in the middle of the night and move my car again so it would be safe. For extra security, I used “The Club” on my car. Does anyone remember this anti-theft device for your steering wheel? Anyone still using one? When visiting family or friends, I also often had to drive around looking for an open spot. Sometimes I had to drive around for about 10 minutes or more. In these residential areas, there were no options to pay for a meter or parking lot. I had to drive around looking for an open parking spot, wait for someone to pull out, create a spot (often close to a corner or fire hydrant), or stalk someone going to their car like a lion hunting a deer. I believe that this is where I honed my attitude about not paying for parking. When I moved to Washington DC for law school, parking was tough to find outside the apartment I lived in. I even paid for a parking permit, and parking was still difficult to find. I didn’t use the car much, except for weekends, but trying to find a spot on Sunday night at 11pm was a nightmare. I would drive around for 15 minutes or more and often end up parking a quarter to a half a mile away. Some of my colleagues paid for parking, but I refused. I saved several hundred dollars a year, benefited from the extra walking, and learned some patience. Boston was even worse. 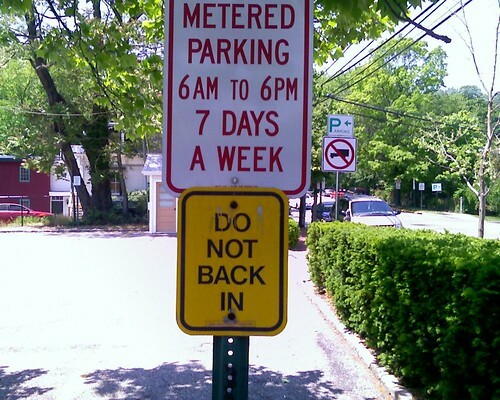 When I lived in the downtown financial district of Boston, the parking restrictions were so strict during the week day that I couldn’t leave my car parked on the street near my residence. I guess I could have ditched the car all together, but between the convenience and the cost of rental cars for the weekends to get around (including exploring the area and visiting relatives in other states), my wife and I put a premium on keeping the car. We ended up paying about $180 per month just to park the car in a garage about a third of a mile away from our downtown apartment. And this was a discount off the normal price (I think the normal price was $260)! If we wanted to park in the garage of our apartment complex on a monthly basis, we would have had to pay about $450 at the time. These experiences gave me the patience to look for parking and helped me realize that I don’t have to always find the closest parking spot to my destination (especially if it costs me); that there are benefits to parking further away either intentionally or out of necessity. That it’s ok to use my legs to walk a quarter mile or so and it won’t hurt me. That it’s better for my wallet, my financial health, and physical health to find that free parking spot that is a little out of the way even if it may cost me a few more minutes of my time. The payoff is money saved and a little physical exercise. More savings and exercise are things most people could use more of these days. Copyright © 2010 by ConsumerMiser.com. All rights reserved. This entry was posted on Saturday, May 1st, 2010 at 12:09 am	and is filed under Frugality, Miser Mentality, Personal Finance, Saving Money. You can follow any responses to this entry through the RSS 2.0 feed. You can leave a response, or trackback from your own site.